“Joey’s Clock” | "An Eclectic Array of Topics"
All I wanted was a wife. 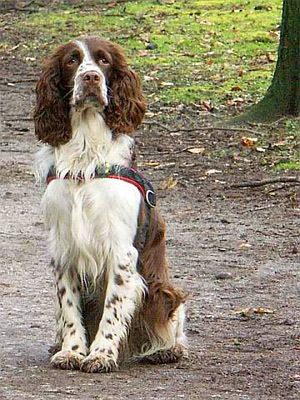 That seemed like a normal desire for a handsome adult English Springer Spaniel like me. Yet, my parents steadfastly refused my request. I tried to explain this desire within my heart to Mom and Dad. They did not seem to understand me and I didn’t know the reason why. Once I had overheard them call me a “dumb dog”. Me dumb?! They were the ones that could not understand me. I understand them perfectly, yet, I was the one called “dumb”. Therefore, I tried the next best thing…direct eye contact. I laid my head on my Dad’s knee, looked up at him and let out a rather loud sigh. After all, they say I have such sad, expressive eyes. I was using my eyes to “beg” for a wife. Surely, my Dad would know what I was saying, because I was using my best asset: My eyes! All he said was “Joey, you have such droopy eyes”. Droopy eyes! These eyes are begging for a wife and Mom and Dad couldn’t figure it out. Mom said, “Jess, I think he wants to go out”. My Dad let me out, but I just sat in my personal porch chair. I then decided to sit looking in the window at them. I was still using my eyes to beg for a wife, hoping against hope they would understand. Then I heard my Mom say, “Look at him. He never ‘went’.” (This was their reference for me “relieving myself) “I wonder what’s wrong with him”. Therefore, Dad just let me back into the house. A bit later, Dad let me out again. I jumped right back up into my personal porch chair. I let out another long sigh. Then the day came that I shall never forget. I saw “Her”. This beauty that now crossed my path, I knew would be my wife! She was casually walking past our house. It was love at first sight. We spoke for a long while. I then asked “Her” to be my wife. She immediately said, “Yes!” We began to make our plans. She said her parents would have no objections. Then I told “Her” of my dilemma. I explained that my parents didn’t even understand that I wanted a wife. I told “Her” how I had even used my eyes to beg for a wife and still got no response from my Mom and Dad. She was utterly amazed that the didn’t understand…especially since I used my eyes to speak to them the deepest desire of my heart. (She seemed to look at me with sympathy) Obviously, a big Kennel wedding was out of the question. Our only solution: ELOPE! We began discussing how we would go about this. I told “Her” I would leave the next day for “Her” place. She lived quite a distance from us, so I must get an early start. We said our farewells until the next day. I was terribly in love with “Her” and excited about the plans we made, yet, sad at the thought of leaving Mom and Dad. Especially since I could not tell them what I was planning. What was the use? They never understood what I was trying to say to them anyway…even though I longed for them to share in my happiness…but knew they could not. I barely slept that night for the anticipation of my trip the next morning. My thoughts were continually upon “Her”…the one I loved. The morning dawned bright, warm and clear. It was a beautiful day. As usual, my Mom pet and hugged me before she let me outside. Usually, I run out as fast as she opens the door. However, I stood there a long moment looking into my Mom’s eyes. I wanted to remember everything about the face I love so much. She said, “What’s the matter Joey?” I wagged my ‘stub’ as I certainly didn’t want her to know what I was up to. My Dad was still in bed. Therefore, instead of going outside right away, I turned and walked into his bedroom. Dad was sleeping, yet, I wanted to kiss him good-bye. He was so close to the edge of the bed, I could kiss him from right where I was standing. My kiss woke him up. He looked at me and said, “Good morning, Joey. You’re such a good boy”. I then walked out of the bedroom and my Mom let me outside. My momentary sadness left as I thought of my love for “Her”…my soon to be wife. Oh! She is such a beauty. My feet now ached as I had walked such a long distance and it was now getting dark. This had been quite a day for me, none like I had ever experienced in the past. I had to fight a rabbit for some wild berries, and was chased by an angry cat causing me to have to swim across a wide swamp. I had actually been in physical danger. I began wondering if I would ever reach my destination. My depression soon turned to joy! I could see “Her” off in the distance. Now, I began running, my ears flying in the breeze as I ran. We talked for a while of the new life that we would soon have together. Yet, because it was already late, we decided to wait until morning to make it “official”. She will become my wife tomorrow. I, Joey Hammond, will be getting a wife. WOW! I had no idea what was going on back at the house after I had left. Aunt Peanut had eventually filled me in. However, I found out that Mom and Dad began getting concerned that I had been gone so long. I had never stayed away very long, let alone all day. By now, it was quite dark. Finally, Dad turned to Uncle Alan and in an angry voice said, “When I find him, I’m going to have his “clock” cleaned!” Uncle Alan just nodded silently. When Aunt Peanut told me this part of their conversation, I wondered what Dad meant by saying he was going to have my “clock” cleaned because I don’t even own a watch. Well, you guessed it…my Dad and Uncle Alan found me. Dad forced me to come with them. However, before I left I pledged my love to “Her: and vowed we wouldn’t be apart for long. I told “Her” that as soon as I could, I would return. I reassured her that she would become my wife. Upon our return to the house, Dad made a phone call to my doctor. I wondered why, as I certainly was not sick. When he got off the phone, he and Mom hugged and petted me. Mom, of course, cried. She said how worried they had been. I could tell by now that they were not mad at me. My Dad even let me get on the couch and I laid my face in his lap. The next day Dad said, “Joey, do you want to go for a ride?” WOW! I was so happy; I love to go for rides with my Dad. I ran to the door but Dad called me over to him and put my leash on me. He never puts a leash on me to go for a ride and I wondered about this. Oh well, I was going for a ride and that’s all I cared about. We stopped in front of my doctor’s office. Then I remembered my Dad’s phone call to my doctor when they brought me home. Surely, he must know I am not sick! My doctor met us at the door. He said, “Hi, Joey. Come with me”. I heard my doctor tell my Dad that I would have to spend the night. SPEND THE NIGHT! Why would I have to spend the night? Can’t they see I’m not sick?! My doctor gave me some medicine that made me very sleepy. I must have fallen into a deep sleep because the next thing I knew it was the following day. My doctor came in and said, “Good morning, Joey. Your Dad is here to pick you up”. As I began to get up, I noticed I was quite unsteady on my feet. I also noticed I was very sore, yet, could not quite figure out where the soreness was coming from. It almost felt like the soreness was from my hips all the way down. Oh well, it wasn’t that bad. I just wanted to go home. Dad was waiting in the front office for me. I wondered what was wrong with him. He was petting me so lightly and speaking to me in baby talk (which he knows I hate). He even picked me up and put me in the truck. This was a first! I always just jump right in. He must be glad I am coming home. When we arrived home, Dad even lifted me out of the truck. Boy! I sure like this royal treatment. I could get used to this real quick. Mom opened the door when she saw us coming up the walkway. She hugged and petted me. In a very soft voice she said, “Joey, we’re so glad you’re home. I made a place for you to rest by the TV.” I thought, REST! Why would I want to rest? However, I suppose I did feel tired. It must have something to do with the medicine my doctor gave me. Whatever it was, it sure packed a punch. Close as I can figure, I must have slept off and on for a couple days. When I got up, I was now steady on my feet and I was no longer sore. I felt like my old self again. PS This is based on a true story. My Dad’s dog ran away and was found across the swamp at his neighbor’s home “visiting” his female (she was also and English Springer). My Dad had Joey neutered the day after he found that he had strolled off their property…something that he’d never done previously…and would never do again. Of course, this one time off the property, produced nine healthty English Springer Spaniel puppies. Thanks! So beautifully written – made me smile and feel so sad at the same time. Thank you for taking the time to read “Joey’s Clock”…and leaving a comment. Receiving a comment is a great source of encouragement.